I designed this kit as a way to celebrate Lunar New Year. It was a very special opportunity to design something of my own culture. Since the kit is for 2019 “the year of the pig”, I decided to illustrate a proud, happy little pig combined with other traditional Chinese elements. 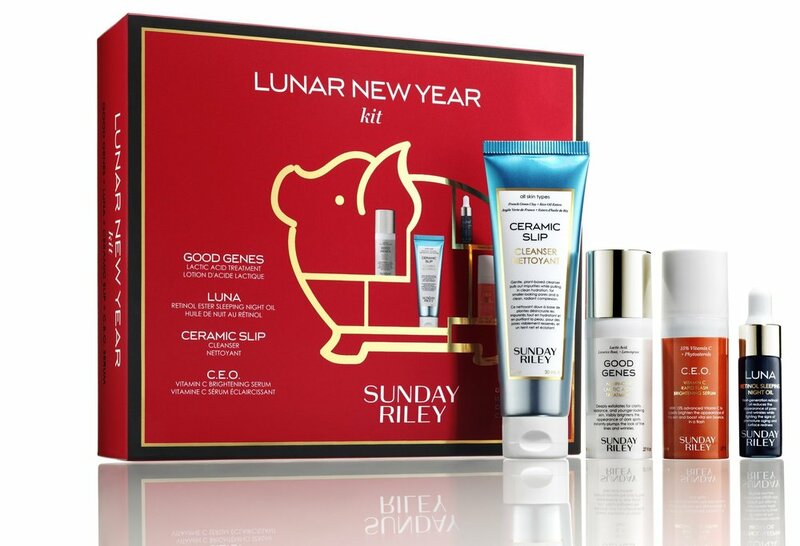 The Sunday Riley product images and the traditional pig-shaped shelf creates a visual balance, combing modern skin care with traditional holidays. In the early stage, I focused on illustrating various forms of pigs and combining it with the year. Since the Sunday Riley products are the main highlight, I tried different ways of bringing the illustrations and the product images together. Although it was a fun challenge to create the balance between abstraction and reality, the biggest challenge was to craft a compelling story. Shelves came to mind naturally when I was brainstorming objects that can highlight SR products. I was greatly inspired by the Chinese traditional selves and recalled that it’s historically used to display valuable art pieces. I joined the shelf concept with the happy pig illustration and created the “piggy shelf” that sets the perfect stage for the products. The renderings below are all part of the iterating process. It was helpful to quickly render these boxes and compare them side by side.